Golden Tractate of Hermes: Now Available! 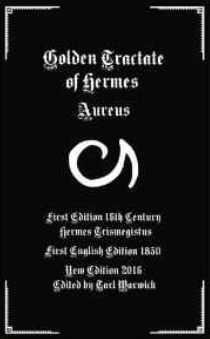 The Golden Tractate of Hermes is one of the shorter variety of alchemical works ever made, but that doesn’t make it worth a read; along with Pontanus’ and Artephius’ works (with allusions infrequently in other materials) it seeks to explain alchemy without all of the symbolism and veils most prevalent therein- a task it performs with some degree of success. Not actually written by Trismegistus but in the Renaissance, the content here is as much to illuminate other works as to explain its own Ixir-crafting process. Author styxhexenhammer666Posted on September 7, 2016 August 3, 2017 Categories alchemical, alchemy, black crow, elixir, golden tractate, hermes trismegistus, ixir, philosophers stone, red lion, red oil, transmutationLeave a comment on Golden Tractate of Hermes: Now Available! A Work of Saturn: Now Available! 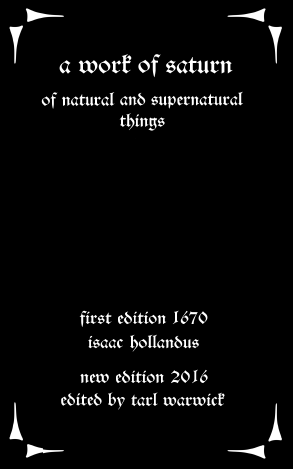 Isaac Hollandus delivers again with one of the better alchemical works I have read. Largely revolving around the use of lead for medical purposes (something I cannot recommend!) “A Work of Saturn” is a bit less veiled and difficult to understand than most texts on alchemy- Hollandus fails on only one account, for while referring to the lead of the philosophers as antimony, the text describes a process which quite clearly involves rudimentary, normal lead- as in, the toxic element, which Hollandus unwisely recommends the alchemist taste in order to make sure the process is working. It is essentially one long process for distilling powdered lead to make elixir- the resulting material (a red oil from a strange sort of compounded mineral deposit) is said by Hollandus to allow the projection (multiplication) of metals, as well as being used in dissolved and ingested form to cure all ailments, or injected into wounds to resolve infections. Author styxhexenhammer666Posted on July 10, 2016 August 3, 2017 Categories a work of saturn, alchemical lead, alchemy, antimony, argent vive, elixir, green dragon, hollandus, isaac hollandus, philosophers stone, red lionLeave a comment on A Work of Saturn: Now Available!